In general, when it comes to gym equipment, Olympic weight benches are very common, not only in commercial gyms but also in home gyms. If you are a serious trainer but can’t go to the gym, an Olympic bench will be a useful piece of gym equipment. Therefore, in this article, I will give you the in-depth review of the best Olympic weight benches for your own home gym. I. What Is The Difference Between An Olympic And A Standard Weight Bench? II. Reasons Why You Should Buy An Olympic Weight Bench For Your Own Home Gym? Overall, there are 2 main types of weight benches: Standard and Olympic weight bench. What are they and what is the difference between them. Standard benches feature thin tubing made from aluminum or a composite alloy and they are generally smaller when compared to an Olympic counterpart. The Standard barbell measures 5 or 6 ft long and weighs of 15 to 25 lb. In addition, its barbell diameter is usually 1 inch in diameter, associated with a corresponding 1 inch center aperture which is designed to hold standard weight plates. Also, the upright dimensions of its bars are quite narrow, so they don’t have a high capacity. On the other hand, Olympic benches are typically longer and wider than the Standard ones. One enormous advantage of this type is that it is able to support extremely heavy lifters. In details, the Olympic barbell weighs 45 lb and measures 7 ft long, which is longer than the Standard one. The range of this weight bench falls between 2.5 lb to 45 lb. Some Olympic bars can totally lead weights of up-to even 1,500lb. Unlike the Standard barbell, the Olympic barbell is mechanically designed in a manner that makes it difficult to tip over. Of course, an Olympic bench is more expensive than a Standard one. However, as I said, if you are an experienced weight lifter with an established level of base strength, then an Olympic bench can help you achieve progressive overload, not a Standard one. Olympic benches are much sturdier compared to standard ones. Therefore, they are able to accommodate even the most serious lifters. Basically, an Olympic bench looks like an adjustable bench or flat bench combined with a sturdy frame. The Olympic bench will never tilt over even if the weight is unbalanced. In addition, these benches are made from high-grade composite steel. Furthermore, the seat usually features thick padding for great comfort. In short, using an Olympic bench will allow you to push the weight to the maximum without being afraid of the bench getting broken. In addition, with an Olympic bench, you can use both Olympic bar and Olympic weight plates. In details, Olympic plates have a 2-inch hole size so they can fit an Olympic bar. On the contrary, Standard bars are only 1 inch in diameter across the whole length. Besides, an Olympic bar is generally rated bsetween 1000 and 1500 lb. That’s why the bar is not likely to bend when you lift heavy weights. Moreover, most of these bars are associated with revolving ends, thus, reducing torque while you’re lifting. Olympic plates and bars are much far more accurate in the weight measurements, compared to Standard ones. Specifically, whenever you pile a number of plates onto an Olympic bar, even a small discrepancy in each plate is able to add a sizeable difference. I know that this is not the common reason why you should buy an Olympic bench for your home gym. But just in case you plan to enter a competitive weightlifting arena, then training with an Olympic bench at home is not a bad idea. Always check the safety of the equipment before you use it. Never use when it appears to be damaged. If there are adjustable safety stops, you have to use them at all times. Do not use the bench when the total weight exceeds the weight limit of the manufacturer. You must balance whatever weight which is applied to the equipment. Keep any moving part away from the moving part of the equipment in order to avoid injuries. Never allow your children near the bench at all times. Don’t forget to read the instructions provided by the manufacturer before using the bench. Whether you have been weight training for years or are just a beginner, a weight bench with a range of settings is very important. 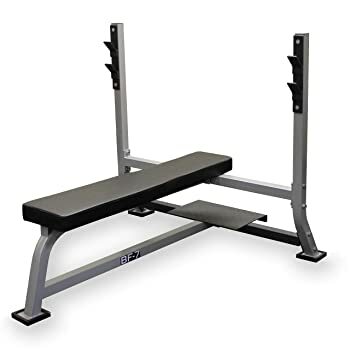 Therefore, if you’re not a guy who is obsessed with the flat barbell bench press, then just choose a bench with adjustable design (FID bench). How much weight are you lifting? Well, this is fairly self-explanatory. If you are lifting heavy weights, I mean more than 200 pounds, say do not choose any weight bench with a low weight capacity, like, under 500 pounds. It all depends on your strength and your body weight. Therefore, before buying anything, just make sure that it can support you, especially while you’re doing the bench press. Once you’ve narrowed down the shortlist of Olympic weight benches to a few stable, strong, and safe designs, the quality of the padding is the next feature you need to consider. In my experiences, it is best to choose an Olympic bench which has padding for the seat and back support that’s 2 inches at least in thickness. This can cushion you against the steel frame of the bench, especially when doing barbell bench press. If you are the person who is looking for a wide range of exercise options, then you’ll need to find a bench fitted with additional attachments. In fact, there are a lot of Olympic weight benches which support a wide range of upper as well as lower body exercises. Generally, you can see that the there are some common attachments found on Olympic weight benches are preacher curl, leg developer, lat pulldown, and pec fly arms. You might have thought that this would be the last thing to look at, but this is still very important. Remember that Olympic benches are more expensive than Standard ones. Looking at an Olympic that is out of your price range is just a waste of time. Once you define your price range, you can cut out a vast majority of weight benches to make sure you find what you’re looking for. The question is “Are you looking for a beginner-level Olympic bench, a mid-range bench, or even a commercial bench for an elite-level lift?”. If you are looking for an Olympic weight bench with a wide range of exercise options, then this Gold’ gym Olympic bench can be the perfect choice. Just like other Olympic bench, it has an adjustable weight bench, a preach curl, leg developer. However, what makes it different is that the bench can be moved out of the the way, allowing you to perform squats and other exercises without any obstruction. That’s why you can easily make this Olympic bench a normal adjustable bench and bench press with the dumbbells on it. The total weight capacity is 610 pounds so you don’t have to worry about the safety. 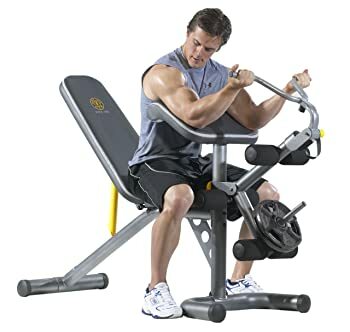 Furthermore, if you are obsessed with heavy weights, especially on the bench press, this bench also features spotters which can help you with that. 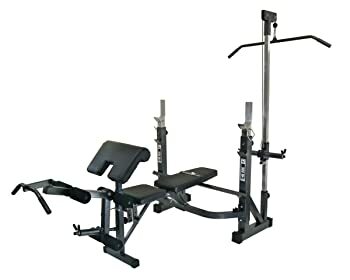 This Olympic weight bench has a very common design with an adjustable bench, preacher curl, and leg developer. At the first glance, you may see that this one has nothing special but actually. But, with the 7-position adjustable backrest, you can do the bench press from different angles or even crunches for abs. The adjustable dual-action leg developer provides you foam rollers so that you can do leg curl/ extension comfortably. Additionally, with built-in Safety hooks and no-pinch design, this bench will help you prevent injury to hand and grip. Besides, the U-shaped front leg stabilizer gives you extra safety and stability when benching pressing heavy weight. This product also comes with an Olympic plate adapter, allowing you to use either Olympic or standard plates. However, this bench has the maximum lifting weight of only 180 pounds. So if you expect to bench 225 lb, then this one is not suitable for you. But you know, with that affordable price, this Olympic bench is still worth your consideration. 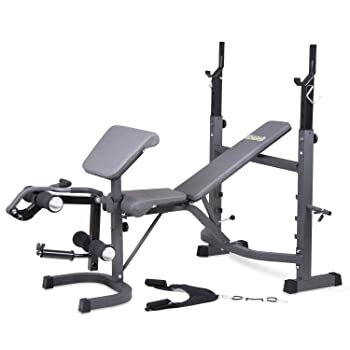 This product also has a full Olympic-size bench with flat, incline, and decline positions. Just like many other Olympic weight benches, it comes with leg lift, preacher curl attachments. However, the best thing I love about this one is that it has a lat tower. Therefore, besides chest, glutes, biceps, you can also train your back and lats. That’s why this product is a perfect choice for anyone who wants to train upper body. Besides, when buying this one, you are provided 3 Olympic plate adapters so you can use either Olympic or standard weights. The downsides of this one are that it is not suitable for tall guys and you have to tighten the bolts regularly. Besides, you can’t put heavy weights on the lat tower because it is improperly aligned so it’s unstable. The first impression of this bench is its heavy duty frame construction with oversized tubing and saefty catches for safe use at home. With this bench, you have 5 different back pad positions: incline, decline, flat and upright. Therefore, just like many other benches, it can help you isolate and develop all areas of your pectorals. It also has removable preacher pad with height adjustment for biceps curl and dual function leg developer for leg curls/ extensions. But the best thing I love about this product is that there are 2 bar catches on the rear of the frame and their height is adjustable so you can completely performs squats if when you are tall. That’s why this is a perfect equipment for a home gym and suitable for everybody. Unlike most of Olympic weight benches, this one doesn’t have an adjustable back pad for different positions as well as other attachments. Actually, it only has flat position. Therefore, this is specifically designed for men and anyone who wants to master the classic flat bench press. 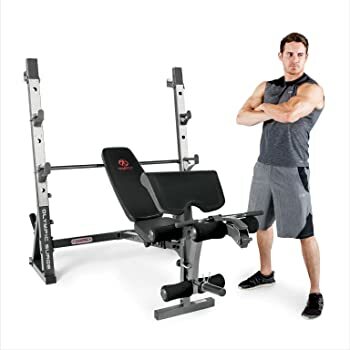 More importantly, as this bench has no moving parts and with the heavy steel structure, the total weight capacity is 1000 lb so you don’t have to worry about your safety when benching heavy weights. Besides, there is a spotter stand for a little extra help. As you can see, the downside of this product is that it can only support the flat benches. That’s why it’s not a good choice for you if you’re looking for a weight bench with a wide range of exercise options. Have you had your own decision on which bench to buy yet? From the reviews of the 5 best Olympic weight benches above, the winner is Body Champ Olympic Weight Bench. I know it is not the most versatile and durable one but for general fitness purposes, it is the the best. Anyways, I hope you will be satisfied with anything you buy and more importantly, don’t forget to workout hard to get a perfect body.